We have tested many different news-readers, and in our opinion, Express NewsPictures is by far the easiest for the novice to set up and use for viewing pictures. (It is shareware, and you will need to purchase it if you continue using it beyond the 30 day trial period.) Â Our support page lists other newsreaders, including several free programs. You could even use Outlook Express, which is probably already installed on your computer. Click here to download and install Express NewsPictures. PLEASE enter information absolutely correctly. Failure to do so is the cause of problems 99% of the time. 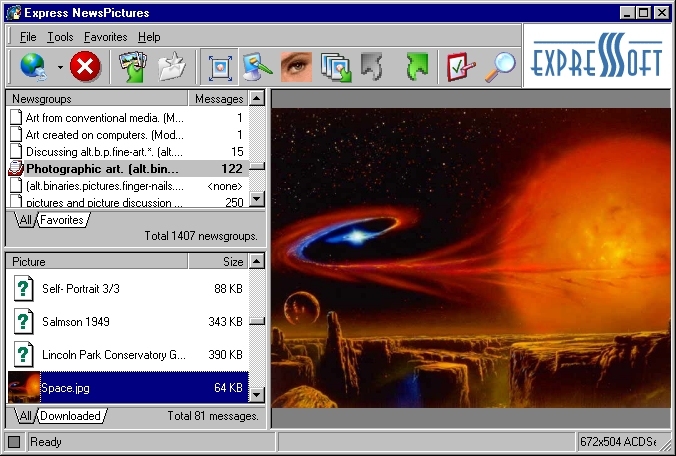 Express NewsPictures immediately goes to work, getting a list of newsgroups which mainly contain pictures. It also shows how many articles each group currently has in it Click on a group which you would like to view, and NewsPictures immediately goes to work getting a list of the files containing pictures. Click on one of the article headings, and the picture will be downloaded and displayed, and also saved on your hard-disk in yourMy NewsPictures directory (or whatever directory you specify).